So what makes this production sassy? In three words: unadulterated, female, fearlessness. That’s a mouth full and plenty to digest. But Vanessa Paul, who is one of the producers of Sassy Mamas, promises there will be no heart burn here, just hearty laughter wrapped around dramatic moments of prose and pontification. Sassy Mamas is enjoying a second run here in Los Angeles. It opened last year in February and show dates sold out quickly night after night. Word of mouth had theatre goes traveling as far as Victorville, California (which is 84 miles away) to see and experience Sassy Mamas. “We brought it back because the audience demanded it. By the time we got to the last day of our run, folks clamored that we extend it. Because there was another show coming in right behind us, we could only do one extension,” said Vanessa. Sassy Mamas is back with all its sass and symbolism starting February 13. Written by playwright Celeste Bedford Walker, it stars the original leading cast of Elayn Taylor, Denise Dowse and Iona Morris, who also directs the play. Vanessa is not new to the world of entertainment. She’s been a working actress for 35 years. She began her acting career in her hometown of Port Arthur, Texas doing commercials. She later moved to New York and worked as a fashion and make up model and that led to roles in movies, stage and television. An opportunity brought her to California where she continued her work in television, film, commercials and stage. She later found love and married husband Alex Morris, whom she has been married to for 18 years. They have one daughter who is an attorney who works in Washington, D.C. as legal counsel for the Department of Homeland Security. In 2008 Vanessa and husband Alex started Sparkling City Entertainment. The company is dedicated to focusing on television, film and stage projects that reflect diversity in characters and content. Past projects include the stage productions “Piano Lesson” and “Jitney” by August Wilson. Sassy Mamas is their latest production, in collaboration with actress Viola Davis (How to Get Away With Murder) and her husband Julius Tennon of Juvee Productions along with Jeff Murray, the owner of the show’s venue, a small 99 seat theater in Los Angeles called Theatre Theater. 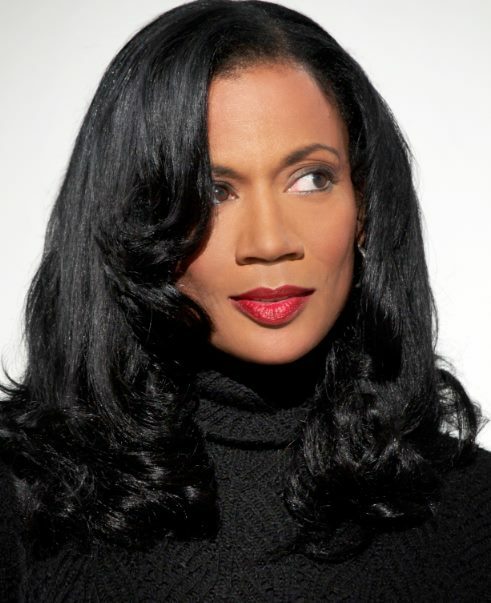 Prior to Sassy Mamas, Sparkling City Entertainment and Juvee Productions collaborated on Camp Logan, a play by the same playwright–Celeste Bedford Walker. This play was nominated for six NAACP Awards and ended up winning three NAACP theater awards for best production, best playwright and best lighting. They now have a new project in the works. Vanessa says to stay tuned. “It gives us power to have our own voice when we produce our own work,” said Vanessa about why she started Sparkling City Entertainment. “This business tends to throw us away when women reach a certain age. We produced Sassy Mamas because we love that we can show the viability of these types of women of this age and substance,” Vanessa concluded. For Vanessa, it’s really about empowerment of those who are underserved and disregarded in the entertainment industry. Sassy Mamas sets out to shatter the myths and misconceptions about mature women with its confluence of female actresses, director, playwright and production staff whom Hollywood would typically dismiss as past their expiration date. It’s a social commentary that has the public and Hollywood taking note. Sassy Mamas opens in Los Angeles at Theatre Theater, 5041 West Pico Boulevard, with a Red Carpet Gala on February 13. February 14 will be a special Valentine’s Day Reception complete with Champagne & Chocolates with the cast. The show runs each weekend through March 29. Show times are at 8 p.m. on Friday and Saturday; 2:00 p.m. on Sunday. Tickets are available at www.sassymamas.brownpapertickets.com or by calling (800) 838-3006. For group rates call (323 ) 571-3232. And you can’t be a sassy mama without a repertoire of sassy foods. Vanessa admits that her range has been recalibrated to include foods that boost her energy and blast the fatigue that once plagued the busy actress and producer. Here she shares her recipe for Sassy Mama Chicken and Vegetable Bake that she recently made for the cast of Sassy Mamas. It’s easy, tasty and a crowd pleaser. Here you have it. A full plate of sassiness from a night out at the theatre to a meal fit for a sassy mama and her court. You can follow Vanessa on Twitter @MsVanessaPaul and Facebook at https://www.facebook.com/Sparkling-City-Entertainment. Season chicken well with all seasonings, liberally or conservatively depending on your taste. 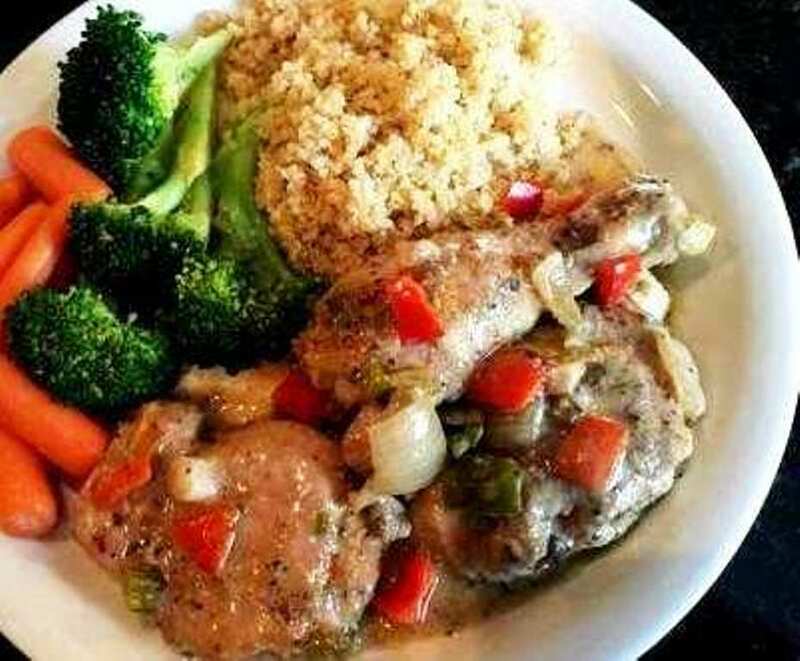 Top chicken with all chopped vegetables–onions, green and red peppers, celery, garlic, and green onions. Drizzle olive oil generously over chicken and chopped vegetables. Top with 3-4 pats of butter (optional). Cover casserole dish tightly with foil–use a small paring knife to make 4 small vent holes in foil. Place dish on center rack in oven and bake at 350-375 degrees 375° degrees Fahrenheit for 1 hour. Prepare separately on the side: In a small saucepan heat the cream of mushroom soup with 1 can of water or milk, as directed on soup can. Remove chicken from oven, carefully pull away foil and put aside for re-use. Pour heated cream of mushroom soup over cooked chicken, covering all pieces. Cover casserole dish with foil and return chicken to oven and bake for another 15-20 minutes at 350 degrees Fahrenheit. This entry was posted in Foodies and tagged Alex Morris, California, Casserole, caviar, Celeste Bedford Walker, Champagne, chicken, collard greens, cougars, Cream of Mushroom Soup, Denise Dowse, Elayn Taylor, Hollywood, How to Get Away With Murder, Iona Morris, Jeff Murray, Julius Tennon, Juvee Productions, Los Angeles, NAACP, Port Arthur, sassy, Sassy Mamas, Sparkling City Entertainment, Texas, Theatre Theater, Valentine’s Day, Vanessa Paul, Vegetable bake, Viola Davis, women of a certain age, women of substance. Bookmark the permalink.